Our Premium Trampoline Springs are made from a process that adds a colored zinc coating to our galvanized steel. This process adds 50% more durability, excellent protection against rust and corrosion, even more protection from the elements and last longer than our regular galvanized steel springs. With our springs having the most coils per inch and 3.0 plus wire gauge. These are the best springs on the market. Special Notes: Theses springs are designed specifically for the 13' x 13' square shaped Skywalker brand trampoline, which because of the way weight is distributed differently on square trampolines vs. round trampolines, square trampolines have more stress on the springs that are in the center of each side of the trampoline, and require thicker and stronger springs in these areas. 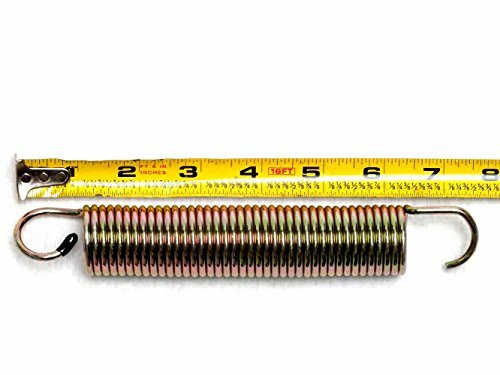 You should only use 3 of these springs on each of the 4 sides of your square trampoline, for a total of 12 springs. DO NOT USE THESE FOR ALL SPRINGS ON YOUR TRAMPOLINE, as that will result in too much tension and reduce your bounciness. Only use 3 of these springs on each side of your trampoline for best results. Specifically Designed for Square Trampolines | Don't Use More than 3 of These on Each Side! A Full 1 Year Warranty + Free Spring Tool with All Premium Spring Orders! SportPlus - 36-piece replacement bungee ropes/cables for Sportplus fitness Trampoline. Maximum weight limit 286 pounds. Spanning tool not included.